RRP £219 and £169 or £199 in most places - next cheapest is £149 at Co-op Electrical. 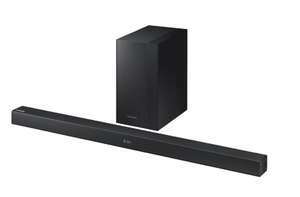 Supercharge your TV’s sound, with the powerful Samsung HWM360 soundbar. Make the most of every movie moment with 4 built-in speakers. Experience 200W of crisp high notes and pure sound that bring every scene to life. With a single Samsung remote for both your TV and Smart Soundbar, discover a completely connected experience at the press of a button. Clear the mess caused by having a number of controllers on your coffee table. Samsung’s Smart Soundbars are designed to work effortlessly in sync with the entire Samsung TV range. Whether you’re watching the latest blockbuster or enjoying your favourite playlist, instantly feel part of the action with the pulsating bass of a separate subwoofer. Then enjoy the flexibility to place it where you like and keep your space uncluttered with wireless connectivity. Keep your space neat and tidy with a wireless connection to your Samsung TV. Experience superb and powerful sound that brings any TV show or movie to life. With a sleek design that complements our TV range, the HW-M360 is the perfect addition when creating your dream home entertainment system. Hear just what you’ve been missing, with the Samsung HWM360. It’s just a shame it’s too wide for my Tv stand. My Sony TV (KD55XE8596) supports Bluetooth, is it 100% compatible with this Soundbar ? Thanks in advanced. The speaker has optical in. 99.9% of tv's have an optical output these days. Just get an optical cable from Poundland and your sorted. Can then use Bluetooth to stream music etc from your phone to the speakers. The speaker has optical in. 99.9% of tv's have an optical output these …The speaker has optical in. 99.9% of tv's have an optical output these days. Just get an optical cable from Poundland and your sorted. Can then use Bluetooth to stream music etc from your phone to the speakers. I’d be very surprised if it’s not boxed with an optical cable. Is this available in silver? Yeah. Not really any need for it here. Why would you want a video and sound connection for just sound?